Nothing beats the tactile yumminess of feeling soft velvet between your fingers. With a texture close to that of baby soft skin, even when crushed, its appearance could either have a metallic sheen if not a matte one. 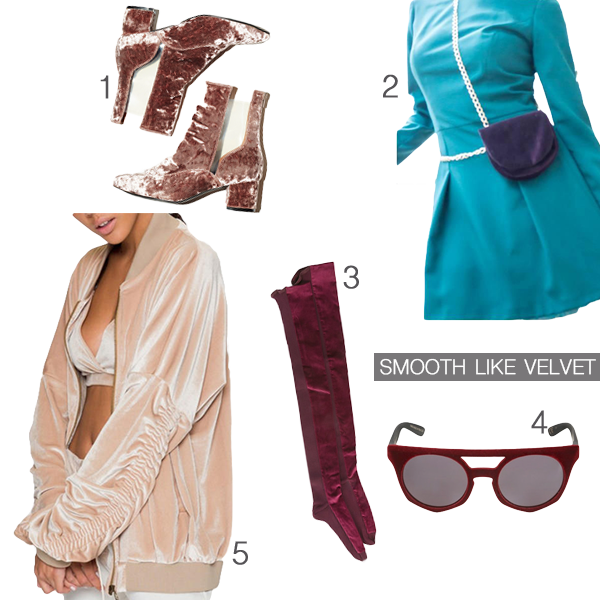 Luckily, you don’t need to rely on just wearing a dress or pants in this coveted textile as you can impress in velvet everything ranging from shades to outerwear. 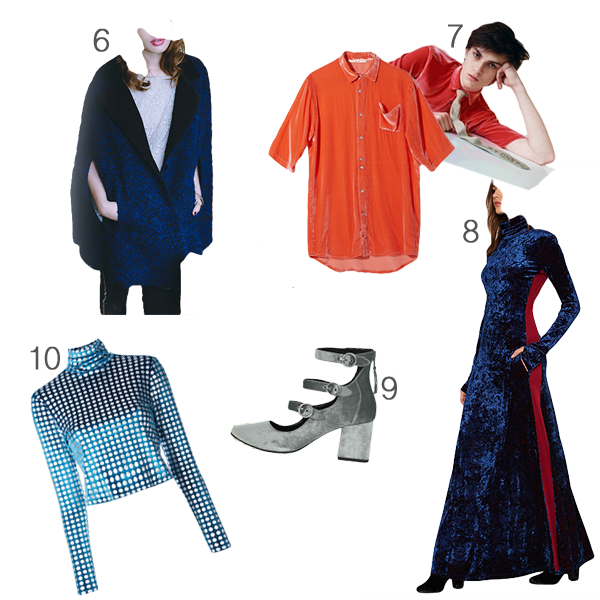 But if you’re having problems figuring out where to begin in what to buy for Fall, here are ten key pieces worthy of any wardrobe. 1-Featuring a sleek pointed toe design + back zipper closure for an easy on-off, you’ll be able to leave your hookups as quickly as you met them in this Chelsea style ankle boot with a velvet upper + ultra cool transparent side panels.|Velveteen Heel Boot, JEFFREY CAMPBELL, FREE PEOPLE 2-A waist clutch with gold chain detail, satisfies the love of harnesses combined with the hands-free appeal of being able to keep your belongings safe, while you dance the night away at your favorite after party way after dark|Black Velvet Waist Clutch, SHTOICA, TICTAIL 3-Pair these sweet velvet trim socks with heels|Velvet Trim Socks, SACAI, farfetch 4-A double bridge with black lenses of these very geometric frames, grants them the ability to double as the perfect go-to headband|I-Top Velvet Frames, ITALIA INDEPENDENT, LUISAVIAROMA 5-Nothing screams, “Make me yours!,” like this oversized velvet bomber with ruched sleeve detail in this luxurious shade of tan|Jaded X Granted Tan Velvet Oversized Bomber, JADED LONDON. 6-A cape like this one in blue velvet with an oversized black tuxedo lapel will probably be the only one you’ll want to own|Cape “Blue Velvet”, RealGoldParis, TICTAIL 7-This velvet shirt makes a perfect addition to your ever changing wardrobe with long short sleeves which would look great over another top bearing extra long sleeves|“JEFF” Velvet Shirt, LAZOSCHMIDL, TICTAIL 8-This flowing maxi dress with a sheer blue crushed velvet shell, full bright red lining + exposed stripe on lining at sides will grant you new admirers for sure|Dress to Impress Dress, HOT AS HELL, NASTY GAL 9-Grey velvet on these multi buckle round toe shoes with zip fastening give them that extra ‘something special’|JOJO Multi Buckle Shoes, TOPSHOP 10-When adding pattern to velvet like this, there’s no denying you’ll get noticed, especially when paired with another pattern to spark more interest|Velvet Effect Spotted Cropped Blouse, HOUSE OF HOLLAND, farfetch.